You will be met and greeted by your private tour guide and driver at the hotel in Hanoi. Departure at 8:00 AM, the morning drive on the High Way (Noi Bai – Lao Cai) offers you a beautiful countryside scenery of the Red River Delta and on to the midland of the Northwestern region. You will have lunch at Lao Cai City around noon. In the afternoon, after 1,5 hour drive, you will arrive Bac Ha district, take a short boat ride on Chay River (if the water level permits), then stretch out with a easy walk to visit Trung Do village of the Tay ethnic minority people. Arrive at Bac Ha and check in a local homestay for the night. This morning, you will be transferred to a trekking point in Muong Hoa Valley where you will do a beautiful trek to visit a few villages of the Black H’mong and enjoy the terraced paddy fields in the area. Get picked up and drive back to town for lunch. The afternoon is spent for a scenic drive to Mu Cang Chai, another rice terrace paradise. You may have time to get some stops on the way for taking pictures. Check in a stilt-house homestay of the Thai people nearby Mu Cang Chai town. Dinner and overnight there. 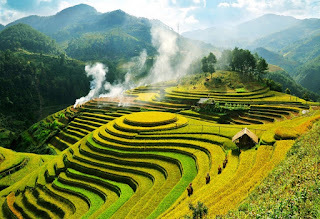 Today, we spend most of the day for a long scenic trek on small paths and back roads from Che Cu Nha to La Pan Tan as this is the best part of the region for you to admire the amazing rice terraced paddy. Late in the afternoon, we drive to Tu Le town for a night at a local hotel. This morning, we will take more walk to visit Tu Le valley before check out of your hotel for the drive back to Hanoi. Lunch is at a local restaurant on the way. Arrive in Hanoi and finish the tour at the door of your hotel. All inquiries or questions of visitors please contact us. How to get the most perfect Fansipan journey? What do you know about Sapa Sivel Waterfall?